For the barrier separating the countries, see Mexico–United States barrier. To the left lies San Diego, California and on the right is Tijuana, Baja California. The building in the foreground on the San Diego side is a sewage treatment plant built to clean the Tijuana River. The Mexico–United States border (Spanish: frontera México–Estados Unidos) is an international border separating Mexico and the United States, extending from the Pacific Ocean in the west to the Gulf of Mexico in the east. The border traverses a variety of terrains, ranging from urban areas to deserts. The Mexico–US border is the most frequently crossed border in the world, with approximately 350 million documented crossings annually. The total length of the continental border is 3,145 kilometers (1,954 mi). From the Gulf of Mexico, it follows the course of the Rio Grande (Río Bravo del Norte) to the border crossing at Ciudad Juárez, Chihuahua, and El Paso, Texas. Westward from El Paso–Juárez, it crosses vast tracts of the Chihuahuan and Sonoran deserts to the Colorado River Delta and San Diego–Tijuana, before reaching the Pacific Ocean. The Mexico–United States border extends 3,145 kilometers (1,954 mi), in addition to the maritime boundaries of 29 kilometers (18 mi) in the Pacific Ocean and 19 kilometers (12 mi) in the Gulf of Mexico. According to the International Boundary and Water Commission, the continental border follows the middle of the Rio Grande—according to the 1848 Treaty of Guadalupe Hidalgo between the two nations, "along the deepest channel" (also known as the thalweg)—from its mouth on the Gulf of Mexico a distance of 2,020 kilometers (1,260 mi) to a point just upstream of El Paso and Ciudad Juárez. It then follows an alignment westward overland and it is marked by monuments for a distance of 859 kilometers (534 mi) to the Colorado River, when it reaches its highest elevation at the intersection with the Continental Divide. It then follows the middle of that river toward the north with a distance of 39 kilometers (24 mi), and ultimately follows an alignment overland toward the west and marked by monuments with a distance of 227 kilometers (141 mi) to the Pacific Ocean. Per the La Paz Agreement, the official "border area" extends 100 kilometers (62 mi) "on either side of the inland and maritime boundaries" from the Gulf of Mexico west into the Pacific Ocean. There is also a 100-mile border zone. The Rio Grande frequently meanders along the Texas–Mexico border. As a result, the United States and Mexico have a treaty by which the Rio Grande is maintained as the border, with new cut-offs and islands being transferred to the other nation as necessary. The Boundary Treaty of 1970 between Mexico and the United States settled all outstanding boundary disputes and uncertainties related to the Rio Grande (Río Bravo del Norte) border. The region is characterized by deserts, rugged hills, abundant sunshine, and two major rivers—the Colorado and the Rio Grande (Río Bravo del Norte). The U.S. states along the border, from west to east, are California, Arizona, New Mexico, and Texas. The Mexican states along the border are Baja California, Sonora, Chihuahua, Coahuila, Nuevo León, and Tamaulipas. Among the U.S. states, Texas has the longest stretch of the border with Mexico, while California has the shortest. Among the states in Mexico, Chihuahua has the longest border with the United States, while Nuevo León has the shortest. Texas borders four Mexican states—Tamaulipas, Nuevo León, Coahuila, and Chihuahua—the most of any U.S. states. New Mexico and Arizona each borders two Mexican states (Chihuahua and Sonora; Sonora and Baja California, respectively). California borders only Baja California. Three Mexican states border two U.S. states each: Baja California borders California and Arizona; Sonora borders Arizona and New Mexico; and Chihuahua borders New Mexico and Texas. Tamaulipas, Nuevo León, and Coahuila each borders only one U.S. state: Texas. Along the border are 23 U.S. counties and 39 Mexican municipalities. For a more comprehensive list, see List of Mexico–United States border crossings. The border separating Mexico and the United States is the most frequently crossed international boundary in the world, with approximately 350 million legal crossings taking place annually. There are 48 U.S.–Mexico border crossings, with 330 ports of entry. At these points of entry, people trying to get into the U.S. are required to open their bags for inspection. Border crossings take place by roads, pedestrian walkways, railroads and ferries. From west to east, below is a list of the border city "twinnings"; cross-border municipalities connected by one or more legal border crossings. The total population of the borderlands—defined as those counties and municipios lining the border on either side—stands at some 12 million people. San Ysidro Port of Entry through vehicle. The Mexico–United States border is the world's most transited border. The San Ysidro Port of Entry is located between San Ysidro, California and Tijuana, Baja California. Approximately 50,000 vehicles and 25,000 pedestrians use this entry daily. Due to business of this entry port, it has influenced the every day life-style of people that live in these border towns. The world's busiest border is having an impact on communities on both sides of the border. The average wait time to cross into the United States is approximately an hour. Having thousands of vehicles transit through the border every day is causing air pollution in San Ysidro and Tijuana. The emission of carbon monoxide (CO) and other vehicle related air contaminants have been linked to health complications such as cardiovascular disease, lung cancer, birth outcomes, premature death, obesity, asthma and other respiratory diseases. Due to the high levels of traffic collusion and the extended wait times, mental health is also impacted by the border's business, affecting the person's stress levels and aggressive behavior. 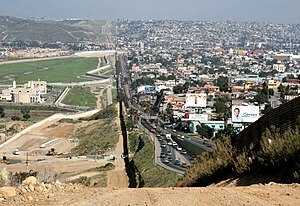 Capture of both sides of the border, Tijuana and San Diego. The San Ysidro border is heavily militarized, separated by three walls, border patrol agents and ICE. Tijuana is the next target for San Diegan developers due to the fast-growing city, its lower cost of living, cheap prices and proximity to San Diego. While this would benefit the tourist aspect of the city, it is damaging to low-income residents that will no longer be able to afford the cost of living in Tijuana. Tijuana is home to many deportees from the United States, many who have lost everything and do not have an income to rely on and are now in a new city in which they have to quickly adapt in order to survive. San Diego developers would bring many benefits to Tijuana but deportees and the poor run the risk of being impacted by the gentrification of Tijuana. San Diego together with Tijuana creates the bi-national San Diego–Tijuana metropolitan area. In the mid-16th century, after the discovery of silver, settlers from various countries and backgrounds began to arrive in the area. This period of sparse settlement included colonizers from different backgrounds. The area was part of New Spain, but due to the lack of population and the diverse citizenry it had, it did not seem to belong to any country. This period lasted until the early 19th century, at which point the United States bought the lands known as the Louisiana Purchase from France and began to expand steadily (militarily) westward in its pursuit of Manifest Destiny. El Paso (top) and Ciudad Juárez (bottom) seen from earth orbit; the Rio Grande is the thin line separating the two cities through the middle of the photograph. El Paso and Juarez make up the third largest U.S. international metroplex after Detroit–Windsor and San Diego-Tijuana. The border itself was not clearly defined and remained so until the Mexican colony became independent from Spain and entered a period of political instability. Mexico attempted to create a buffer zone at the border that would prevent possible invasion from the North. The Mexican government encouraged thousands of their own citizens to settle in the region that is now known as Texas and even offered inexpensive land to settlers from the United States in exchange for populating the area. The influx of people did not provide the defense that Mexico had hoped for and instead Texas declared its independence in 1836, which lasted until 1845 when the U.S. annexed it. The constant conflicts in the Texas region in the mid-19th century eventually led to the Mexican–American War, which began in 1846 and ended in 1848 with the Treaty of Guadalupe Hidalgo. In the terms of the peace treaty, Mexico lost more than 2,500,000 square kilometers (970,000 sq mi) of land, 55% of its territory, including what is today California, Arizona, New Mexico, Utah, Nevada and parts of Colorado, Wyoming, Kansas, and Oklahoma. In addition, all disputes over Texas and the disputed territory between Rio Grande and Rio Nueces were abandoned. Five years later the Gadsden Purchase completed the creation of the current United States–Mexico border. The purchase was initially to accommodate a planned railway right-of-way. These purchases left approximately 300,000 people living in the once disputed lands, many of whom were Mexican nationals. Following the establishment of the current border a number of towns sprang up along this boundary and many of the Mexican citizens were given free land in the northern regions of Mexico in exchange for returning and repopulating the area. The Treaty of Guadalupe Hidalgo and another treaty in 1884 were the agreements originally responsible for the settlement of the international border, both of which specified that the middle of Rio Grande was the border—irrespective of any alterations in the channels or banks. The Rio Grande shifted south between 1852 and 1868, with the most radical shift in the river occurring after a flood in 1864. By 1873 the moving river-center border had cut off approximately 2.4 square kilometers (590 acres) of Mexican territory in the El Paso-Juarez area, in effect transferring the land to the United States. By a treaty negotiated in 1963, Mexico regained most of this land in what became known as the Chamizal dispute and transferred 1.07 square kilometers (260 acres) in return to the United States. Border treaties are jointly administered by the International Boundary and Water Commission (IBWC), which was established in 1889 to maintain the border, allocate river waters between the two nations, and provide for flood control and water sanitation. Once viewed as a model of international cooperation, in recent decades the IBWC has been heavily criticized as an institutional anachronism, by-passed by modern social, environmental and political issues. The economic development of the border region on the Mexican side of the border depended largely on its proximity to the United States, due to its remoteness from commercial centers in Mexico. During the years of Mexican President Porfirio Díaz, between 1876 and 1910, the border communities boomed, due mostly to close ties to the United States, and the Mexican government's support for financial investments from the United States. Railroads were built that connected the northern Mexican states more to the United States than to Mexico and the population grew tremendously. The mining industry also developed, as did the United States’ control of it. By the early 20th century companies from the United States controlled 81% of the mining industry and had invested five hundred million dollars in the Mexican economy overall, twenty-five percent of it in the border regions. The United States Immigration Act of 1891 authorizes the implementation of inspection stations at ports of entry along the Mexican and Canadian borders. The United States Immigration Act of 1917 requires the passing of a literacy test and head tax by Mexicans wanting to enter the United States legally, but during World War I, where labor shortages were growing, the provisions were temporarily suspended. The United States Immigration Act of 1924 establishes the United States Border Patrol. The Mexican Revolution, caused at least partially by animosity toward foreign ownership of Mexican properties, began in 1910. The Revolution increased the political instability in Mexico, but did not significantly slow United States investment. It did reduce economic development within Mexico, however, and the border regions reflected this. As the infrastructure of communities on the United States side continued to improve, the Mexican side began to fall behind in the construction and maintenance of important transportation networks and systems necessary to municipal development. Although the Mexican Revolution caused insecurity in Mexico itself, it also strained United States-Mexico relations. With the Mexican Revolution lasting for 10 years, ending in 1920, and World War I simultaneously occurring between 1914 and 1918, the division between the United States and Mexico began to polarize the two nation-states further apart. Constant battles and raids along the border made both authorities nervous about borderland security. The Zimmerman Telegram, allegedly sent by German officials, was meant to bait Mexico to go to war with the United States in order to reconquer what was taken from them during the U.S.-Mexican War. This inspired the increase development of the Federal Bureau of Investigation (FBI) to monitor suspicious activities and potential violence at the border. Within 10 years, constant wars caused border towns to transform into battlefields, which intensified transborder restrictions, dispatched federal soldiers to patrol the border, and requested the construction of fences and barriers between border towns. When the wars concluded, restrictions for crossing the border became more laxed and most soldiers were sent home; however, the fences remained as a physical reminder of the division between the two nations. As years passed, more fences and higher barriers were established as a result of continuous debates of where the boundary line was officially marked along the United States and Mexico. In the first decade of the 21st century, illegal border crossers caused, or impacted the extinguishing of, several wildfires near the border in Arizona. Data from the United States Border Patrol Agency's (USBP) 2010 annual report shows that among the total number of border crossings without documentation from various countries into the United States, 90 percent were from Mexico alone. In addition, there are more than 6 million undocumented Mexican nationals residing in the United States. The border, with a length of 3,145 kilometers (1,954 mi), has a very high rate of documented and undocumented migrant crossings every year. With such a high rate of people crossing annually to the United States, the country has invested in several distinct security measures. In 2010, due to insecurity and instability at the southern border of the U.S. President Barack Obama signed an appropriation bill, which gave the Customs and Border Protection, specifically the Border Patrol, 600 million dollars to implement and improve security. The U.S. government has invested many millions of dollars on border security, although this has not stopped undocumented immigration in the United States. In June 2018, the U.S. government announced installation of facial recognition system for monitoring the immigrant's activities. While the Border Patrol has changed a lot since its inception in 1924, its primary mission remains unchanged: to detect and prevent the illegal entry of immigrants into the United States. Together with other law enforcement officers, the Border Patrol helps maintain borders that work – facilitating the flow of legal immigration and goods while preventing the illegal trafficking of people and contraband. Since the Border Patrol's strategy has occasionally changed and most recently within the past two decades, the present strategy to enforce migration along the United States-Mexico border is by the means of "prevention through deterrence". Its primary goal is to completely prevent undocumented immigrants from entering the United States from Mexico rather than apprehending the unauthorized who are already in the country. As assertive as it was, "prevention through deterrence" has not been as successful as it was planned to do, due to the doubling in size of undocumented immigrants population during the two decades leading up to 2014. 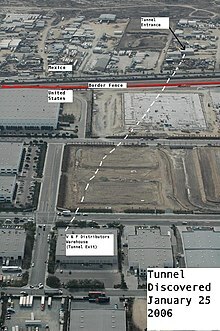 In order to effectively enforce border protection, the United States' policies and regulations have looked to make border crossings more hazardous through the implementation of various operations, one of those being the "funnel effect". 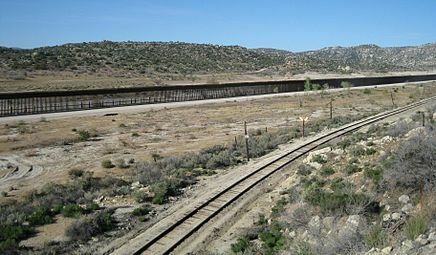 The tactic was meant to discourage migration from Mexico into the United States by forcing migrants to travel further around barriers where the terrain and weather are more risky, but the strategy was not as successful as initially planned, due to the will of migrants making the choice to pass through extreme circumstances. As a result, the effect funneled more immigrants to their death even with the assistant of coyotes (smugglers). Not only has this approach caused fatalities throughout the United States-Mexico border, but it has even stirred up a nuisance for documented immigrants and American citizens. There has been general concern about the Border Patrol and other agencies abusing their authority by racial profiling and conducting unwarranted searches outside the exception of the 25 mile border zone, but still within the 100 mile border zone. Notwithstanding these setbacks, billions of dollars of governmental funding are still spent on the "prevention through deterrence" strategy, especially within the rise of the Trump administration. In 2012, Border Patrol agents made over 364,000 arrests of people illegally entering the country. Considerable success has been achieved in restoring integrity and safety to the Southwest border, by putting in place a border-control strategy. These include Operation Gatekeeper in San Diego, CA, Operation Hold the Line in El Paso, TX, Operation Rio Grande in McAllen, TX, Operation Safeguard in Tucson, AZ, and the Arizona Border Control Initiative (ABCI) along the Arizona border. The border has the highest number of registered legal crossings of any land border in the world. Over five million cars and trucks travel through the border annually. According to Vulliamy, one in five Mexican nationals will visit or work in the United States at one point in their lifetime. As of 2010, the border is guarded by more than twenty thousand Border Patrol agents, more than at any time in its history. However, they only have "effective control" of less than 1,100 kilometers (680 mi) of the 3,145 km (1,954 mi) of total border, with an ability to actually prevent or stop illegal entries along 208 km (129 mi) of that border. The border is paralleled by United States Border Patrol interior checkpoints on major roads generally between 25 and 75 miles (40 and 121 km) from the U.S. side of the border, and garitas generally within 50 km of the border on the Mexican side. There are an estimated half a million illegal entries into the United States each year. Border Patrol activity is concentrated around border cities such as San Diego and El Paso which have extensive border fencing. This means that the flow of illegal immigrants is diverted into rural mountainous and desert areas, leading to several hundred migrant deaths along the Mexico–U.S. border of those attempting to cross into the United States from Mexico illegally and vice versa. Undocumented labor contributes $395 billion to the economy every year. While the U.S. is in favor of immigration, the increase in undocumented immigration has given border-crossing a negative image. There are around 11.5 million undocumented workers in the U.S. today, and 87% of undocumented immigrants have been living in the U.S. for more than 7 years. Local economies that develop on the Mexican side capitalize not only on available skills but also on available, usually discarded, materials. Small businesses trade in clothes that are purchased by the pound and cardboard from the United States. Some items, like the used tires found everywhere along the border, are made into certain items that support local economies and define a border. The Secure Fence Act of 2006 was passed providing for the construction of 700 miles (1,100 km) of high-security fencing. Attempts to complete the construction of the Mexico–United States barrier have been challenged by the Mexican government and various U.S.–based organizations. In January 2013, the Government Accountability Office released a report stating that the United States Border Patrol only intercepted sixty-one percent of individuals illegally crossing the border in 2011, which translated to 208,813 individuals not apprehended. 85,827 of the 208,813 would go on to illegally enter the United States, while the rest returned to Mexico and other Central American countries. The report also showed that the number of illegal border crossings has dropped. The apprehensions per (fiscal) year are shown in the graph; they reached a maximum of over 1.643 million in the year 2000. Similar numbers had been reached in 1986 with over 1,615 million. Since 2010, the numbers have consistently remained beneath half a million. The increase of border security throughout the years has progressively made crossings at the United States-Mexico border more dangerous which has developed a questionable matter of human rights crisis at the border. The number of migrant deaths occurring along the United States-Mexico border has dramatically increased, due to the change of migrant traffic moving into rural areas from urban spaces. Along the Arizona-Mexico border, only seven migrant deaths were recorded in 1996, however from 2001 until 2012, it was discovered that there were the remains of over 2,000 migrants. Since the majority of deaths occur in rural areas, where extreme temperatures are common, it is most likely that the number of recorded deaths are only a fraction of the total. Due to harsh, hard to reach terrains, human remains may not be found for years, if not, ever. According to the U.S. Border Patrol, apprehensions of central Americans at the US-Mexico border reduced from 70,000 to 55,000 attempted illegal migrants from 2007 to 2011. Thereafter, the number of apprehensions increased dramatically to 95,000 in 2012, 150,000 in 2013 and 220,000 in 2014. The increased apprehensions could have been either due to improved border security, due to a dramatic rise in attempted crossings, or both. 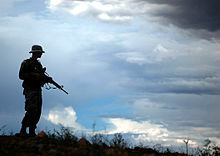 As per the media, in the fiscal year of 2006, there were twenty-nine confirmed border incursions by Mexican government officials, of which seventeen were by armed individuals. Since 1996 there have been 253 incursions by Mexican government officials. In 2014 the U.S. Department of Homeland Security informed California Representative Duncan D. Hunter that since 2004, there have been 300 documented border incursions, which resulted in 131 individuals being detained. The Washington Times has reported that on Sunday, August 3, 2008, Mexican military personnel who crossed into Arizona from Mexico encountered a U.S. Border Patrol agent, whom they held at gunpoint. The soldiers later returned to Mexico, as backup Border Patrol agents came to investigate. Proponents of greater spending on the border argue that continuing the buildup is necessary due to increased violence and drug trafficking[when?] from Mexico spilling into the United States. However, critics such as the Washington Office on Latin America (WOLA) have argued that the diminishing number of border crossings can only be partially attributed to U.S. security measures. Unintentional factors, such as a weakened U.S. economy in the wake of the 2008 financial crisis and increased violence in northern Mexico have made attempting illegal border crossings more risky and less rewarding. On September 20, 2017, California Attorney General Becerra filed a lawsuit alleging that the Trump administration has overstepped its powers in expediting construction of a border wall. 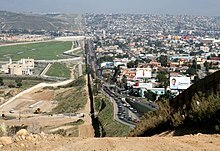 As of the end of 2017, Mexico had not agreed to pay any amount toward the wall, no new tariffs on Mexican goods had been considered by the U.S. Congress, the U.S. Congress had not appropriated funding for a wall, and no further wall construction had started beyond what was already planned during the Obama administration. In June 2018, the Trump administration established a new policy of separating parents from their children at the Mexican border. People asking for asylum at official ports of entry were "being turned away and told there’s no room for them now." The U.S. and Mexico mutually placed tariffs on each other's exports. On November 8, 2018, the Trump administration announced new rules to deny asylum to anyone who crosses into the United States illegally from any nation, at Trump's discretion. This was based on the Supreme Court decision of Trump v. Hawaii and the presidential powers of the Immigration and Nationality Act of 1965. Trump signed a proclamation the next day to specify that people crossing the Mexican border illegally would not qualify for asylum; he called the march of migrants from Central America towards the United States a "crisis". Civil rights groups strongly criticized the move, and several groups, including the Southern Poverty Law Center, the American Civil Liberties Union, and the Center for Constitutional Rights, filed a lawsuit in the U.S. District Court for the Northern District of California to challenge the proclamation. Judge Jon S. Tigar ruled in favor of the advocacy groups on November 20, 2018, placing an injunction on the administration to delay implementation of the rule. The administration appealed to the Ninth Circuit, where a divided 2-1 panel ruled that the new asylum rules were inconsistent with existing law and upheld the injunction. On December 21, 2018, the Supreme Court declined to hear the administration's challenge, leaving the injunction in place and preventing the asylum ban from being enforced. During the fiscal year from September 2017 to September 2018, U.S. border agents arrested 107,212 people traveling in families, a record-high number. During the following five months (October 2018 through February 2019), that record was shattered by the arrest of 136,150 people traveling in families. On March 31, 2019, Trump threatened to close the border, cutting off trade between the countries. On April 4, Trump said that instead he would give Mexico a year to stop illegal drugs from coming into the United States. If this did not happen, he said tariffs on automobiles would be used first, and then closing of the border. While running for president, Trump claimed that the wall would cost $8 to $12 billion and that he could force Mexico to pay for it. Serious cost estimates of the proposed wall vary widely. In early 2017, shortly after Trump took office, the Department of Homeland Security estimated the cost at $22 billion, while Democratic staff on the Senate Homeland Security and Governmental Affairs Committee estimated $70 billion to build the wall and $150 million in annual maintenance. Significant cost overruns and missed deadlines are common in government projects; in recent U.S. history, see, for example, the Big Dig and the Boeing Dreamliner. In the summer of 2017, four major construction companies planned to bid for the contract. The Customs and Border Protection agency budgeted $20 million to hire these companies to build half-million-dollar prototypes of the wall. At this time, Congress had only approved $341 million to maintain the existing wall; no funds had been allocated to build new sections of wall. The Department of Homeland Security recommended that the wall's height should be between 18 and 30 ft (5.5 and 9.1 m) and its depth should be up to 6 ft (1.8 m) to deter drug traffickers from building tunnels. As of March 2019[update], international asylum laws continued to be flouted at the border. A volunteer from the Humane Border group is refilling water stations located on the desert of the U.S.-Mexico border. Among the diversity of humanitarian assistance along the U.S.–Mexico border, there are groups who take on a more hands-on approach. The Humane Borders, No More Deaths, and Samaritans are all humanitarian groups that provide water in order to reduce deaths of immigrants who are journeying through the Arizona desert. Despite having a common goal, a policy passed in 2010 by the U.S. Fish and Wildlife federal agency allowed water drums with 55 gallons of water to be placed in roads of disturbed areas, which supports method of Humane Borders and counters the methods of No More Deaths and Samaritans who place one-gallon jugs of water hanging from trees. No More Deaths (No Más Muertes) is a non-governmental organization (NGO) that is headquartered in Tucson, Arizona (roughly 66 miles from the U.S.-Mexico border) that is designed to assist in ending death and suffering of immigrants along the U.S.-Mexico border by upholding fundamental human rights. Elemental services of No More Deaths is to provide humanitarian assistance, giving food and first aid treatment, witness and respond to human rights abuses, encouraging humane immigration policy, and making phone calls to relatives of immigrants. 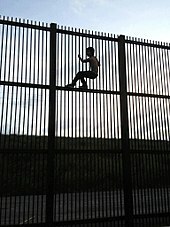 Since its founding in 2004, No More Deaths has provided assistance to thousands of migrant border crossers, however the Border Patrol and other public land agencies near the U.S.-Mexico border have challenged the efforts of various humanitarian groups, by following immigrants to a medical volunteer camp and raiding it. Humanitarian groups along the border have been tested by Border Patrol and other agencies, however the authority of the Trump administration has introduced a new tier of restriction through unprecedented levels of surveillance, harassment, and intimidation to border relief efforts. Nevertheless, volunteers of No More Deaths are committed each day to hike the trails in search of a sick or wounded abandoned by their coyote (guide), and most importantly, they walk to bear witness of injustice sufferings against basic human rights. In contrast, there are other humanitarian groups whose goal is create healthier communities along the U.S.–Mexico border. Due to an incidence rate of HIV and tuberculosis being higher in border towns such as El Paso, Texas and Ciudad Juarez, Sonora than at the national level in both countries, the Nuestra Casa Initiative, developed with the help of Project Concern International, the US Agency for International Development, the Alliance of Border Collaborative, Dr. Eva Moya and Damien Schumman, tried to counter the health disparities by using a cross-border strategy that moved around an exhibit prominent in various Museums and universities. Similarly, Special Action Groups as part of the Border Health Strategic Initiative created by the University of Arizona with other groups helped create a healthier Hispanic community in Arizona border towns by creating policy and infrastructure changes both in the public and private factor. These groups provided humanitarian assistance to counter the prominence of Type 2 diabetes among the Hispanic community since they acquired a block grant for new walking trails and encouraged public elementary schools to provide healthier food choices for students. A shelter is an example of a place where immigrants can feel safe from mistreatment, discrimination, extreme temperatures, and hunger. After many days, people are physically and mentally exhausted and are usually in desperate need of basic human necessities. Upon arriving at a shelter, travelers are finally able to properly bathe themselves and receive a new pair of clothes. In recent years, the number of unaccompanied children migrating through the United States-Mexico border has substantially increased and many find a shelter as a respite from their sufferings. In these shelters, children have a right to educational, mental, and health care along with other developmental services where they can rest from a troubled home country or traumatic journey. Even though there are frequent hazards that many immigrants have to encounter when crossing the desert near the Mexico-United States border, they still need to be cautious of local gangs. Immigrants are considered easy targets by gang members, because they do not have the strength to resist aggressive offenders and end up left with nothing. In June 2018, U.S. Attorney General, Jeff Sessions, disqualified victims of gangs or domestic violence to be reasonable causes for asylum seekers. Despite the physical dangers of nature and thugs, immigrants at shelters still fall victim to trolling researchers and journalists. Fortunately, they do not harm those they are interviewing, but constantly looking for a "good" story can aggravate anyone who is still recovering from an arduous journey. A shelter like the Juan Bosco Shelter in Nogales, Sonora is supported by the Border Community Alliance, a nonprofit organization who looks to bridge the Mexico-United States border through fostering a community. Not only do these Hispanic communities faced health inequalities, but political inequalities as well. The need for political change was so huge that it has encouraged Hispanic women to engage in activism at a local level. The Neighborhood Action Group in Chula Vista, California is one of the groups of the attracted the help of local Hispanic women to implement a feminist perspective in activism in spite of the social and economic obstacles as well as Assembly Bill No. 775, 2005 that prohibited children being used as interpreters. These humanitarian groups have implemented various strategies to pursue their goals that ultimately try to counter the number of immigrant deaths and abuses in immigrant detention even if it means the criminalization and higher levels of discrimination against them. In regards to the Humanitarian assistance along the U.S.–Mexico border on the Mexico side, most humanitarian groups focus on assisting the deportees. As rates of deportation continue to drastically increase, “the deportation of many individuals is becoming more and more notable” in the streets of Mexico cities. As a result, many humanitarian groups have form along the Mexico cities where undocumented individuals are deported such as Nogales, Mexico. The humanitarian groups consist of faith-based communities and primarily non-profit organizations that assist the exhausted deportees. Not only are the deportees exhausted, but also many of them do not have any resources with them such as money, food, or family information that can help them. This oftentimes leads them to be homeless and go days without eating. They often go homeless because they "do not know where to turn to receive a meal, find shelter and to make a phone call". Along with them arriving without those resources, many immigrants "find themselves in distress" due to the fact that they arrive to Mexico emotionally and psychologically devastated. Contributing factors that might have caused them to be devastated can either be that they were separated from "their family members or the inability to work legally in the United States". Therefore, the primary purpose of the humanitarian groups on the Mexico side of the border is to create a pathway for transitional support such as providing the deportees food, shelter, clothing, legal help and social services. In addition, there are humanitarian groups that provides meals and shelter to deportees according to their deportation documents. Humanitarian groups along the border in Mexico are El Comedor, Nazareth House, Camino Juntos, La 72, and FM4: Paso Libre. A National Border Patrol Strategic Plan was first developed in 1994 to deal with the fact that borders were being overrun by illegal immigrants and drug dealers. It was then updated in 2004 and 2012. 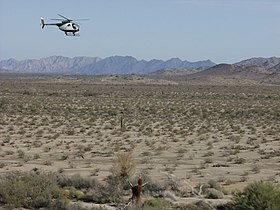 In 2004 the updated strategy focused on command structures, intelligence and surveillance, enforcement and deployment of U.S. Border Patrol agents to better respond to threats at the border. The strategic planning led to broader policy development for the Department of Homeland Security which led to the Secure Border Initiative (SBI) in 2005 to secure U.S. borders and reduce illegal migration. The main components of SBI dealt with staffing concerns, removal capacity, surveillance and tactical infrastructure and interior enforcement. An additional component was “high consequence enforcement”, which was not the subject of a formal public policy document. There was the allowance, historically, for voluntary returns of individuals apprehended at the border by Border Patrol agents. These voluntary returns, after the SBI of 2005, were limited to three “high consequence outcomes”. One "high consequence outcome" was formal removal, which meant the individual would be deemed ineligible for a visa for at least five years and subject to criminal charges if caught re-entering illegally. The Immigration and Nationality Act permitted aliens to be formally removed with “limited judicial processing” known as expedited removal. The Department of Homeland Security has expanded between 2002 and 2006, expedited removal for “certain aliens that entered within previous two weeks and were apprehended within 100 miles (160 km) of the border”. Another “high consequence outcome” is the increase in criminal charges. Department of Homeland Security has also worked with the Department of Justice to increase the number of apprehended individuals crossing the border illegally who are charged with criminal offenses. Most of these cases are prosecuted under Operation Streamline. The third “high consequence outcome” is known as remote repatriation. This is the return of apprehended Mexicans to remote locations by Border Patrol rather than the nearest Mexican port of entry. 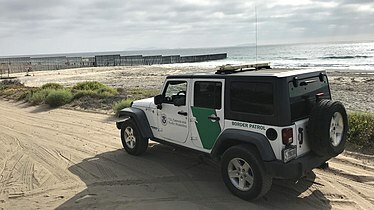 The United States has established a 100-mile (160 km) border zone which applies to all U.S. external borders including all coasts, in effect covering two-thirds of the U.S. population, including a majority of the largest cities in the U.S. and several entire states (namely Connecticut, Delaware, Florida, Hawaii, Maine, Michigan, New Hampshire, New Jersey, and Rhode Island). The border zone was established by the U.S. Department of Justice in its interpretation of the Immigration and Nationality Act of 1952. Customs and Border Protection (CBP) officials have authority to stop and search within this zone, and are authorized to enter private property without a warrant within 25 miles (40 km) of the border as well as establish checkpoints. The Fourth Amendment of the U.S. Constitution protects against unreasonable search and seizure. However, under the border search exception, this protection does not fully apply at borders or border crossings (also known as ports of entry) or in the border zone. This means that much of the U.S. population is subject to CBP regulations including stop and search. There are some limits to CBP officials’ ability to stop and search. For instance CBP officials are not allowed to pull anyone over without a reasonable suspicion of immigration violation or crime, or search vehicles without warrant or probable cause. The ACLU, however, found that CBP officials routinely ignore or misunderstand the limits of authority, and this is compounded by inadequate training, lack of oversight and failure to hold officials accountable for abuse—incidence of abuse is common. Operation Streamline refers collectively to zero-tolerance policies implemented at the Mexico–U.S. border that seek to remove undocumented immigrants through an expedited process if they have arrived with missing or fraudulent identification or have previously been convicted for an immigration crime. Operation Streamline was first implemented in Del Rio, Texas, in 2005. The program has since expanded to four out of the five federal judicial districts on the U.S.–Mexico border: Yuma, Arizona; Laredo, Texas; Tucson, Arizona; and Rio Grande Valley, Texas. Previously, immigrants apprehended at the border were either given the option to voluntarily return to their home country or they were placed in civil immigration proceedings. After Operation Streamline was implemented, nearly all people apprehended at the border who are suspected of having crossed illegally are subject to criminal prosecution. Defendants who are charged with crossing into the U.S. illegally are tried en masse to determine their guilt. Defense attorneys often are responsible for representing anywhere from six to forty immigrants at once. Around 99% of defendants in Operation Streamline proceedings plead guilty. The defendants are charged with a misdemeanor if convicted of crossing the border illegally for the first time, and a felony if it is a repeat offense. 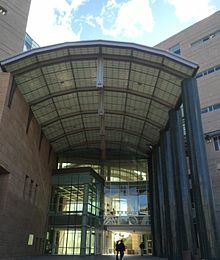 In December 2009, it was decided in United States v. Roblero-Solis that en masse judicial proceedings like those in Operation Streamline violated Rule 11 in the Federal Rules of Criminal Procedure. Rule 11 states that the court must determine that a guilty plea is voluntarily made by addressing the defendant personally in court. The Roblero-Solis case determined that “personally” means that the judge must address the defendant in a person-to-person manner. Though many courts have changed their procedures to adapt to the ruling, there are still forms of en masse trials practiced at the border. Proponents of Operation Streamline claim that the harsher prosecution has been an important factor in deterring immigrants from crossing the border illegally. Apprehensions have decreased in certain sectors after 2005, which is seen as a sign of success. For example, the Del Rio, Texas, sector saw a decline from 2005 to 2009 of 75% (from 68,510 to 17,082). Similarly, apprehensions declined in Yuma, Arizona, by 95% (from 138,438 to 6,951) from 2006 to 2009. Criticisms of Operation Streamline point to the program’s heavy use of federal court and enforcement resources as a negative aspect. In addition, the prosecution of all illegal border crossings takes the focus away from prosecuting more serious crimes. They claim that the program’s cost is too high for the effectiveness of the work it is accomplishing. In response to the claim that Operation Streamline is an effective deterrent, critics of the program claim that the incentives to cross the border in order to work or be with family are much stronger. The Agreement on Cooperation for the Protection and Improvement of the Environment in the Border Area, known as the La Paz Agreement, was signed into law on August 14, 1983, and became enforceable on February 16, 1984. This agreement to protect the environment is the political foundation between the U.S. and Mexico for 4 subsequent programs. Each program has addressed environmental destruction in the border region resulting from the rise of the maquiladora industries, those who migrated to Northern Mexico to work in the industries, the lack of infrastructure to accommodate the people, Mexico's lax regulations concerning all these factors, the resulting spillover into the U.S., and the U.S.'s own environmentally destructive tendencies. The programs were: IBEP (1992), Border XXI (1996), Border 2012 (2003) and Border 2020 (2012). 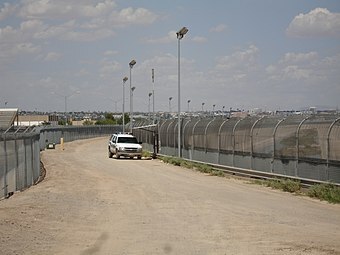 In 2006, during the presidency of George W. Bush, Congress approved Secure Fence Act which allowed the Department of Homeland Security to erect a border fence along the United State and Mexico border. A total of $2.2 billion was allocated to building this wall in five different areas of the border. Congress also approved a different law called the REAL ID Act which gave the Department of Homeland Security the approval to build the wall without taking into consideration the environmental and legal issues related to the wall. The United States Congress insisted that the act was passed for the sake of national security of the United States. According to a delegation of Arizona park and refuge managers, wildlife biologists, and conservationists who studied the United State and Mexico border concluded that building a wall along the Mexico border will also have negative impacts on the natural environment in the region. They argued that the border wall will negatively affect the wildlife in the Sonoran Desert including plants and animals. Naturally, animals do not tend to stay in one place and instead, they expedite to various places for water, plants, and other means in order to survive. The wall would restrict animals to a specific territory and would reduce their chances of survival. According to Brian Segee, a staff attorney with Wildlife Activists says that except high flying birds, the rest of the animals would not be able to move to other places due to the wall along the border. For instance, participants in this study argued that some of the animal kinds such as javelinas, ocelots, and Sonoran pronghorn would not be able to freely move along the border areas. It would also restrict the movement of jaguars from Sierra Madre Occidental forests to the southwestern parts of the United States. According to Brian Nowicki, a conservation biologist at the Center for Biological Diversity, there are 30 animal species living in the Arizona and Sonora that face danger and their movement to find new habitat and sources of survival would be restricted by the border wall. In late 2006, the United States Department of Homeland Security (DHS) announced a rule regarding new identification requirements for U.S. citizens and international travelers entering the United States implemented on January 23, 2007. 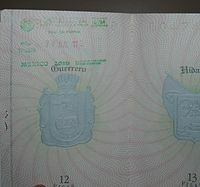 This final rule and first phase of the WHTI specifies nine forms of identification, one of which is required to enter the United States by air: a valid passport; a passport card; a state enhanced driver's license or state enhanced non-driver ID card (available in Michigan, New York, Vermont, and Washington) approved by the Secretary of Homeland Security; a trusted traveler program card (NEXUS, FAST, or SENTRI); an enhanced tribal identification card; a Native American Tribal Photo Identification Card; Form I-872 – American Indian Card; a valid Merchant Mariner Document when traveling in conjunction with official maritime business; or a valid U.S. military identification card when traveling on official orders. The Mexico–United States border is the world's busiest border, specifically the crossing at San Diego, California, to Tijuana, Baja California (15.6 miles between the cities), known as the San Ysidro Port of Entry. 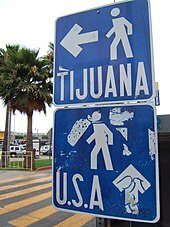 In the U.S., Interstate 5 crosses directly to Tijuana, and the highway's southern terminus is this crossing. In 2005, more than 17 million vehicles and 50 million people entered the U.S. through San Ysidro. Among those who enter the United States through San Ysidro are transfronterizos, American citizens who live in Mexico and attend school in the United States. Along the coast of Baja California, there are neighborhoods of Americans living in Tijuana, Rosarito Beach, and Ensenada, whose residents commute to the United States daily to work. Additionally, many Mexicans also enter the United States to commute daily to work. In 1999, 7.6% of the labor force of Tijuana was employed in San Diego. In August 2015, Mexico began enforcing a rule that all foreign citizens that plan to stay in the country for more than seven days or are travelling on business will have to pay a 330 peso (21 dollar) fee and show their passport. 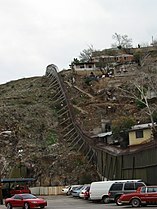 The U.S. government had plans in 2006, during the Bush administration, to erect a border fence along the Mexico–U.S. border. The controversial proposal included creating many individual fences. Almost 600 miles (970 km) of fence was constructed, with each of the individual fences composed of steel and concrete. In between these fences are infrared cameras and sensors, National Guard soldiers, and SWAT teams on alert, giving rise to the term "virtual fence". Construction on the fence began in 2006, with each mile costing the U.S. government about $2.8 million. In 2010, the initiative was terminated due to costs, after having completed 640 miles (1,030 km) of either barrier fence or vehicle barriers, that were either new or had been rebuilt over older, inferior fencing. The Boeing-built SBI-net systems of using radar, watchtowers, and sensors (without a fence or physical barrier) were scrapped for being over budget, full of glitches, and far behind schedule. When animals are imported from one country to another, there is the possibility that diseases and parasites can move with them. Thus, most countries impose animal health regulations on the import of animals. Most animals imported to the United States must be accompanied by import permits obtained in advance from the U.S. Department of Agriculture's Animal and Plant Health Inspection Service (APHIS) and/or health certification papers from the country of origin. Veterinary inspections are often required, and are available only at designated ports; advance contact with port veterinarians is recommended. Animals crossing the United States–Mexico border may have a country of origin other than the country where they present for inspection. Such animals include those from the U.S. that cross to Mexico and return, and animals from other countries that travel overland through Mexico or the U.S. before crossing the border. APHIS imposes precautions to keep out several equine diseases, including glanders, dourine, equine infectious anemia (EIA), equine piroplasmosis (EP), Venezuelan equine encephalitis (VEE), and contagious equine metritis (CEM). APHIS also checks horses to prevent the introduction of ticks and other parasites. In the Lower Rio Grande Valley, U.S. Department of Agriculture inspectors look for horses and livestock that stray across the border carrying ticks. These animals are often called wetstock, and the inspectors are referred to as tickriders. Per APHIS, horses originating from Canada can enter the United States with a Canadian government veterinary health certificate and a negative test for EIA. Horses from Mexico must have a health certificate; pass negative tests for EIA, dourine, glanders, and EP at a USDA import center; and undergo precautionary treatments for external parasites at the port of entry. Horses from other Western Hemisphere countries must have the same tests as those from Mexico and, except for horses from Argentina, must be held in quarantine for at least seven days as a check for VEE. APHIS imposes similar testing and certification requirements on horses from other parts of the world but without the quarantine for VEE. These horses are held in quarantine—usually three days—or until tests are completed. Because the disease equine piroplasmosis (equine babesiosis) is endemic in Mexico but not established in the United States, transportation of horses from Mexico to the United States requires evaluation of horses for the presence of this disease. Transportation of horses from Mexico to the United States normally requires at least three days in quarantine, which is incompatible with most recreational equestrian travel across the border. A leading exception to this rule is the special waiver obtained by riders participating in the Cabalgata Binacional Villista (see cavalcade). Import from the United States to Mexico requires evidence within the prior 45 days of freedom from equine infectious anemia, among other requirements. ^ a b c Edwin Mora (May 19, 2010). "Senate Democratic Whip Compares Sealing the Mexican Border to Trying to Keep Drugs Off of I-95". Cybercast News Service. Retrieved March 9, 2011. ^ a b c d Golson, Barry; Thia Golson (2008). Retirement Without Borders: How to Retire Abroad—in Mexico, France, Italy, Spain, Costa Rica, Panama, and Other Sunny, Foreign Places. New York, New York: Simon & Schuster. p. 75. ISBN 978-0-7432-9701-1. Retrieved March 9, 2011. ^ a b Glenday, Craig (2009). Guinness World Records 2009. Random House Digital, Inc. p. 457. ISBN 978-0-553-59256-6. Retrieved March 9, 2011. ^ a b "US, Mexico open first new border crossing in 10 years". AFP. Washington. January 12, 2010. Archived from the original on February 28, 2014. Retrieved December 3, 2012. The US–Mexico border is the busiest in the world, with approximately 350 million crossings per year. ^ "Treaty to Resolve Pending Boundary Differences and Maintain the Rio Grande and Colorado River as the International Boundary between the United States of America and México" (PDF). November 23, 1970. Retrieved December 7, 2014. ^ a b McCarthy, Robert J. (Spring 2011). "Executive Authority, Adaptive Treaty Interpretation, and the International Boundary and Water Commission, U.S.–Mexico". Water Law Review: 3–5. SSRN 1839903. ^ "United States Section Directive" (PDF). Archived from the original (PDF) on October 15, 2011. Retrieved November 11, 2011. ^ "La Paz Agreement" (PDF). Epa.gov. Retrieved April 9, 2018. ^ "The United States–Mexico Border Region at a Glance" (PDF). United States–Mexico Border Health Commission. New Mexico State University. Archived from the original (PDF) on September 15, 2012. Retrieved December 3, 2012. In 2001, over 300 million two-way border crossings took place at the 43 POEs. ^ a b Hodge, Roger D. (2012). "Borderworld: How the U.S. Is Reengineering Homeland Security". Popular Science. 280 (1): 56–81. ^ Bogan, Jesse. "In Pictures: America's Busiest Border Crossings". Forbes. Retrieved July 27, 2018. ^ "A Day at the Busiest Border Crossing in the World". POLITICO Magazine. Retrieved July 27, 2018. ^ Ahmed, Azam. "Before the Wall: Life Along the U.S.-Mexico Border". Retrieved July 27, 2018. ^ a b MESA, OTAY. "Border Wait Times and Border Crossing Statistics - OTAYMESA". OTAYMESA. Retrieved July 27, 2018. ^ "San Ysidro Is Getting a Clearer Look at Just How Polluted it Is - Voice of San Diego". Voice of San Diego. April 23, 2018. Retrieved July 27, 2018. ^ a b "Border Health Equity Transportation Study" (PDF). February 27, 2015. ^ "The World's Most Dangerous Borders". Foreign Policy. Retrieved July 27, 2018. 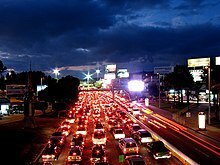 ^ "Cost of Living in Tijuana, Mexico. Jul 2018 prices in Tijuana". Expatistan, cost of living comparisons. Retrieved July 27, 2018. ^ "Tijuana Wants You To Forget Everything You Know About It". BuzzFeed News. Retrieved July 27, 2018. ^ Lakhani, Nina (December 12, 2017). "This is what the hours after being deported look like". The Guardian. ISSN 0261-3077. Retrieved July 27, 2018. ^ "San Diego Developers See a New Frontier in Tijuana". Voice of San Diego. November 30, 2015. Retrieved July 27, 2018. ^ Martínez, Oscar J. (1988). Troublesome Border. Tucson: University of Arizona Press. ISBN 978-0-8165-1104-4. ^ "Treaty of Guadalupe Hidalgo". Ourdocuments.gov. 1848. Retrieved December 6, 2014. ^ Byrd, Bobby; Mississippi, Susannah, eds. (1996). The Late Great Mexican Border: Reports from a Disappearing Line. El Paso: Cinco Puntos Press. ISBN 978-0-938317-24-1. ^ Hart, John M. (2000). "The Mexican Revolution, 1910–1920". Oxford History of Mexico. New York: Oxford University Press. pp. 433–66. ISBN 978-0-19-511228-3. ^ a b Lorey, David E. (1999). The U.S.-Mexican Border in the Twentieth Century. Wilmington: Scholarly Resources, Inc. ISBN 978-0-8420-2756-4. ^ "Some Events in the History of Mexico and the Border". The Journal of American History. 86 (2): 453–54. 1999. doi:10.2307/2567039. JSTOR 2567039. ^ Sherman, John W. (Fall 2016). "Fascist 'Gold Shirts' on the Río Grande: Borderlands Intrigue in the Time of Lázaro Cárdenas". Journal of South Texas. 30: 8–21 – via EBSCOhost. ^ St. John, Rachel (2011). Line in the Sand: A History of the Western U.S.-Mexico Border. Princeton, New Jersey: Princeton University Press. p. 4. ISBN 9780691156132. ^ Anu K. Mattal (November 22, 2011). Federal Agencies Could Better Utilize Law Enforcement Resources in Support of Wildland Fire Management Activities (Report). United States Government Accountability Office. Retrieved July 4, 2018. "McCain blames some Arizona wildfires on illegal immigrants". CNN. June 19, 2011. Retrieved July 4, 2018. ^ Options for Estimating Illegal Entries at the U.S.–Mexico Border The National Academies Press. Washington D.C.: The National Academies Press. 2013. doi:10.17226/13498. ISBN 978-0-309-26426-6. ^ Martínez, Ruben (2004). "Fortress America". Index on Censorship. 33 (3): 48–52. ^ Levin, Sam (June 5, 2018). "US government to use facial recognition technology at Mexico border crossing". the Guardian. Retrieved June 6, 2018. ^ a b Ewing, Walter A. (2014). "Enemy Territory: Immigration Enforcement in the US - Mexico Borderlands". Journal on Migration and Human Security. 2: 198–222 – via HeinOnline. ^ Newell, Bryce Clayton (May 2016). "Information seeking, technology use, and vulnerability among migrants at the United States–Mexico border". Information Society. 32: 176–91 – via EBSCOhost. ^ a b "The U.S.–Mexico border: under the economic lens and in the historical frame". pulsamerica.co.uk. ^ a b "Borders and Identity". smithsonianeducation.org. ^ "Border Patrol Overview". cbp.gov. ^ a b c d Vulliamy, Ed (2010). Amexica: War Along the Borderline. Farrar, Straus and Giroux. ISBN 978-0-374-10441-2. ^ U.S. Department of Homeland Security (June 23, 2010). "Fact Sheet: Southwest Border Next Steps". Retrieved August 6, 2010. ^ Jeffrey, Terence P. (September 24, 2009). "Administration Will Cut Border Patrol Deployed on U.S.–Mexico Border". Cybercast News Service. Archived from the original on December 9, 2009. Retrieved September 25, 2009. ^ Terence P. Jeffrey (March 31, 2011). "Federal Auditor: Border Patrol Can Stop Illegal Entries Along Only 129 Miles of 1,954-Mile Mexican Border". Cybercast News Service. Retrieved March 31, 2011. ^ "BORDER PATROL: Available Data on Interior Checkpoints Suggest Differences in Sector Performance" (PDF). United States General Accounting Office. July 2005. ^ "BORDER PATROL: Checkpoints Contribute to Border Patrol's Mission, but More Consistent Data Collection and Performance Measurement Could Improve Effectiveness" (PDF). United States General Accounting Office. August 2009. ^ Aduana Mexico (2007). "Aduanas 25 de las Reglas de Caracter General en Materia de Comercio Exterior para 2007" (in Spanish). Archived from the original on February 24, 2012. ^ a b "Illegal Immigration – Border-Crossing Deaths Have Doubled Since 1995; Border Patrol's Efforts to Prevent Deaths Have Not Been Fully Evaluated" (PDF). Government Accountability Office. August 2006. p. 42. ^ a b c Dinan, Stephen (January 9, 2013). "Interceptions of immigrants stubbornly low". Washington Times. Retrieved January 12, 2013. ^ a b "United States Border Patrol" (PDF). Retrieved June 27, 2018. ^ Johnson, Leif (November 2015). "Material Interventions on the US-Mexico Border: Investigating a Sited Politics of Migrant Solidarity". Antipode. 47: 1244 – via EBSCOhost. ^ Martinez, Daniel E.; Reineke, Robin; Rubio-Goldsmith, Raquel; Anderson, Bruce E.; Hess, Gregory L.; Parks, Bruce O. (2013). "A Continued Humanitarian Crisis at the Border: Undocumented Border Crosser Deaths Recorded by the Pima County Office of the Medical Examiner, 1990-2012". SSRN Electronic Journal. doi:10.2139/ssrn.2633209. ISSN 1556-5068. ^ "Statistics - SW Border apprehensions". www.cbp.gov. CBP - US Border patrol (Official website). Retrieved November 6, 2018. ^ "Report: Border Patrol confirms 29 incursions by Mexican officials into U.S. in 2007". San Diego Union Tribune. Retrieved January 17, 2008. ^ "MSNBC report on Border incursion Oct 18 2007". MSNBC. Retrieved January 17, 2008. ^ "Mexican incursions inflame border situation". MSNBC. Retrieved January 17, 2008. ^ "DHS to Hunter: More than 300 border incursions by Mexican military and law enforcement authorities since January 2004". Congressman Duncan Hunter. United States House of Representatives. June 17, 2014. Retrieved June 17, 2014. ^ "Border patrol agent held at gunpoint". Washington Times. August 8, 2008. ^ Potter, Mark. "Debate rages over Mexico 'spillover violence' in U.S". NBC News. Retrieved September 24, 2012. ^ "Further Buildup on US–Mexico Border Unnecessary: Report". InSight Crime. April 20, 2012. Retrieved December 7, 2014. ^ CNN, Stephen Collinson and Jeremy Diamond. "Mexican president disputes Trump over border wall payment discussion". CNN. Retrieved October 7, 2016. ^ "How realistic is Donald Trump's Mexico wall?". BBC News. September 1, 2016. Retrieved October 7, 2016. ^ BBC News (January 26, 2017). "Trump orders wall to be built on Mexico border". BBC News. Retrieved January 26, 2017. ^ BBC News (January 26, 2017). "Mexico: We will not pay for Trump border wall". BBC News. Retrieved January 26, 2017. ^ Reuters (January 26, 2017). "Trump seeks 20 percent tax on Mexico goods to pay for wall, crisis deepens". Reuters. Retrieved January 26, 2017. ^ Baum, Caroline (March 6, 2019). "Forget what Donald Trump said: Tariffs are a tax on American consumers". MarketWatch. Retrieved March 7, 2019. ^ a b Sullivan, Sean; Snell, Kelsey (March 16, 2017). "Republicans skeptical about paying for wall as Trump releases budget". Washingtonpost.com. Retrieved April 9, 2018. ^ "Trump keeps making it harder for people to seek asylum legally". Vox. June 5, 2018. Retrieved June 20, 2018. ^ Aleem, Zeeshan (June 6, 2018). "Trump hit Mexico with steel tariffs. Mexico is hitting back — and targeting Republicans". Wall Street Journal. Retrieved March 7, 2019. ^ Shear, Michael (November 8, 2018). "Trump Claims New Power to Bar Asylum for Immigrants Who Arrive Illegally". The New York Times. Retrieved December 21, 2018. ^ a b Shear, Michael; Sullivan, Eileen (November 9, 2018). "Trump Suspends Some Asylum Rights, Calling Illegal Immigration 'a Crisis'". The New York Times. Retrieved December 21, 2018. ^ Jordan, Miriam (November 20, 2018). "Federal Judge Blocks Trump's Proclamation Targeting Some Asylum Seekers". The New York Times. Retrieved December 21, 2018. ^ "US Appeals Court Won't Immediately Allow Trump Asylum Ban". Associated Press. December 7, 2018. Retrieved December 21, 2018 – via The New York Times. ^ Kelly, Caroline; de Vogue, Ariane (December 21, 2018). "Supreme Court upholds block on Trump's asylum ban". CNN. Retrieved December 21, 2018. ^ "U.S. Border Patrol Southwest Border Apprehensions by Sector FY2018". U.S. Customs and Border Protection. Retrieved March 7, 2019. ^ Gomez, Alan (April 1, 2019). "Cutting aid and closing ports: Here's what's happening at the southern border". USA Today. Retrieved April 1, 2019. ^ Collins, Michael; Fritze, John; Jackson, David (April 4, 2019). "President Trump says he will delay closing the border with Mexico for a year". Asheville Citizen-Times. Retrieved April 4, 2019 – via USA Today. ^ Bennett, Brian; Berenson, Tessa; Abramson, Alana (February 13, 2019). "How Republicans Are Talking Trump Into Accepting a Smaller Border Wall Deal". Time. Retrieved March 7, 2019. ^ Greenwood, Max (February 9, 2017). "DHS report pegs cost of border wall at up to $21.6 billion: report". The Hill. Retrieved March 7, 2019. ^ Carney, Jordain (April 18, 2017). "Senate Dems: Trump's border wall could cost nearly $70 billion". The Hill. Retrieved March 7, 2019. ^ Nixon, Ron (August 31, 2017). "U.S. Moves to Build Prototypes for Mexican Border Wall". The New York Times. Retrieved August 27, 2018. ^ "Trapped in Tijuana: Migrants face a long, dangerous wait to claim asylum". NBC News. March 18, 2019. Retrieved March 19, 2019. ^ a b Star, Brady McCombs Arizona Daily. "US allows new water stations by border". Arizona Daily Star. Retrieved April 6, 2018. ^ Bird, Jo (November 2014). "Human Rights on the US/Mexico Border". Pandora’s Box (1835-8624). 21: 94–101 – via EBSCOhost. ^ Boodman, Eric (July 6, 2017). "After Trump's immigration crackdown, a desert clinic tries to save lives without breaking the law". STAT. Retrieved December 1, 2018. ^ Smith, Sophie (October 2017). "No More Deaths: Direct Aid in the US-Mexico Border Zone" (PDF). South Atlantic Quarterly. 116: 851–62 – via EBSCOhost. ^ Sundberg, Juanita (April 2013). "Prayer And Promise Along The Migrant Trail". Geographical Review. 103: 230–34 – via EBSCOhost. ^ Moya, Eva, et al. “Nuestra Casa: An Advocacy Initiative to Reduce Inequalities and Tuberculosis along the US–Mexico Border.” International Public Health Journal, vol. 8, no. 2, 2016, pp. 107–119. ^ Moya, Eva; Chavez-Baray, Silvia; Wood, William W.; Martinez, Omar (2016). "Nuestra Casa: An advocacy initiative to reduce inequalities and tuberculosis along the US–Mexico border". International Public Health Journal. 8: 107–119. ISSN 1947-4989. Retrieved June 23, 2018. ^ a b Cohen, Stuart J.; Meister, Joel S.; deZapien, Jill G. (2016). "Special Action Groups for Policy Change and Infrastructure Support to Foster Healthier Communities on the Arizona–Mexico Border". Public Health Reports. 119 (1): 40–47. doi:10.1177/003335490411900110. ISSN 0033-3549. PMC 1502256. PMID 15147648. ^ Sweas, Megan (July 2014). "Brief Moments to Care for Immigrant Kids". National Catholic Reporter. 50: 15–16 – via EBSCOhost. ^ Rhodan, Maya (November 2018). "Give Me Shelter". Time. 192: 36–41 – via EBSCOhost. ^ "Our Mission". Retrieved November 9, 2018. ^ De León, Jason (2015). The Land of Open Graves: Living and Dying on the Migrant Trail. University of California Press. p. 104. ISBN 0520282752. ^ Bosco, Fernando J.; Aitken, Stuart C.; Herman, Thomas (2011). "Women and children in a neighborhood advocacy group: engaging community and refashioning citizenship at the United States–Mexico border". Gender, Place & Culture. 18 (2): 155–178. doi:10.1080/0966369X.2010.551652. ISSN 0966-369X. ^ Androff, D. K.; Tavassoli, K. Y. (2012). "Deaths in the Desert: The Human Rights Crisis on the U.S.–Mexico Border". Social Work. 57 (2): 165–173. doi:10.1093/sw/sws034. ISSN 0037-8046. PMID 23038878. ^ a b "New Organization Emerges to Aid Deported Mexican Nationals | San Miguel de Allende | Atención San Miguel". Atencionsanmiguel.org. Retrieved April 6, 2018. ^ "Humanitarianism from the ground: humanitarian aid to migrants and refugees in Mexico | Oxford Department of International Development". Qeh.ox.ac.uk. Retrieved April 6, 2018. ^ "Kino Border Initiative - Iniciative Kino para la Frontera". Kino Border Initiative. Retrieved April 6, 2018. ^ a b c d e Seghetti, Lisa (December 31, 2014). "Border Security: Immigration Enforcement Between Ports of Entry" (PDF). Congressional Research Service. ^ Catherine E. Shoichet (May 24, 2018). "The US border is bigger than you think". CNN. Retrieved July 16, 2018. ^ a b c d e "The Constitution in the 100-Mile Border Zone". American Civil Liberties Union. ^ Rickerd, C. "Customs and Border Protection's (CBP's) 100-Mile Rule" (PDF). American Civil Liberties Union. ^ a b c d Lydgate, L. (2010). "Assembly-Line Justice: A Review of Operation Streamline". California Law Review. 98 (2): 481–544. JSTOR 20743978. ^ a b c d e f g Nazarian, E. (2011). "Crossing Over: Assessing Operation Streamline and the Rights of Immigrant Criminal Defendants at the Border". Loyola of Los Angeles Law Review. 44: 1399–430. hdl:hein.journals/lla44. Archived from the original on 2011. ^ a b c d e Kerwin, D.; McCabe, K. "Arrested on Entry: Operation Streamline and the Prosecution of Immigration Crimes". Migration Policy Institute. ^ "Agreement on Cooperation for the Protection and Improvement of the Environment in the Border Area" (PDF). US Environmental Protection Agency. 1983. Retrieved December 2, 2014. ^ Smith, Colin. "1 U.S. – Mexico Cooperation for the Health of the Environment in the Border Region: A Policy History Analysis". Archived from the original on November 13, 2013. ^ a b Cohn, Jeffrey P. (2007). "The Environmental Impacts of a Border Fence". BioScience. 57 (1): 96. doi:10.1641/B570116. ISSN 1525-3244. JSTOR 10.1641/b570116. ^ "WHTI: Enhanced Drivers License". Getyouhome.gov. Archived from the original on February 15, 2012. Retrieved April 9, 2018. ^ "Traveling to USA?". archive.org. Archived from the original on September 11, 2004. ^ Sandra Dibble (July 11, 2010). "Number of border crossings stabilizes". San Diego Union Tribune. Retrieved January 5, 2013. ^ OECD (September 28, 2010). Regional Development Policies in OECD Countries. OECD Publishing. p. 331. ISBN 978-92-64-08725-5. ^ Berndes, Barry (2009). The SAN DIEGAN – 41st Edition. The SAN DIEGAN. p. 227. ISBN 978-1-890226-13-8. ^ Gaynor, Tim (2009). Midnight on the Line: The Secret Life of the U.S.–Mexico Border. Macmillan. p. 81. ISBN 978-1-4299-9462-0. ^ Brown, Patricia Leigh (January 16, 2012). "Young U.S. Citizens in Mexico Brave Risks for American Schools". New York Times. Retrieved September 8, 2014. ^ Yogerst, Joe; Mellin, Maribeth (2002). Traveler's Companion California. Globe Pequot. p. 341. ISBN 978-0-7627-2203-7. Retrieved September 8, 2014. ^ Levine, Robert N. (2008). A Geography Of Time: On Tempo, Culture, And The Pace Of Life. Basic Books. p. 190. ISBN 978-0-7867-2253-2. Retrieved September 8, 2014. ^ Mendoza, Cristobal; Loucky, James (2008). "Recent Trends in Mexico-U.S. Border Demographics". In Alper, Donald K.; Day, John Chadwick; Loucky, James (eds.). Transboundary Policy Challenges in the Pacific Border Regions of North America. University of Calgary Press. p. 55. ISBN 978-1-55238-223-3. ^ Dibble, Sandra. "New pedestrian crossing unveiled in Tijuana". Sandiegouniontribune.com. Retrieved April 9, 2018. ^ "Why it's Mexico's turn to tighten the US border". Christian Science Monitor. August 20, 2015. Retrieved April 9, 2018. ^ "New Rules Go Into Effect At Busy U.S.–Mexico Border Crossing". Npr.org. Retrieved April 9, 2018. ^ Hsu, Spencer S. (March 16, 2010). "Work to cease on 'virtual fence' along U.S.–Mexico border". The Washington Post. ^ "Ports Designated for the Importation of Animals". Animal and Plant Health Inspection Service (APHIS). Archived from the original on February 2, 2007. Retrieved October 5, 2011. ^ "Port Veterinarian List". Animal and Plant Health Inspection Service (APHIS). Archived from the original on December 9, 2006. Retrieved October 5, 2011. ^ a b "Equine Importation". Animal and Plant Health Inspection Service (APHIS). Archived from the original on October 17, 2010. Retrieved October 5, 2011. ^ Miller, Tom (2000). On the Border: Portraits of America's Southwestern Frontier. iUniverse. pp. 72–73. ISBN 978-0-595-14334-4. ^ "Veterinary Science". Ca.uky.edu. Retrieved April 9, 2018. ^ "Import health requirements of Mexico for horses (non slaughter) exported from the United States" (PDF). Animal and Plant Health Inspection Service (APHIS). December 2005. Archived from the original (PDF) on April 19, 2009. Retrieved October 5, 2011. Arbelaez, Harvey; Milman, Claudio (2000). "The new business environment of latin america and the caribbean". International Journal of Public Administration. 23 (5–8): 553–562. doi:10.1080/01900690008525475. ISSN 0190-0692. Kelly, Patricia, and Douglas Massey. "Borders for Whom? The Role of NAFTA in Mexico-U.S. Migration". The ANNALS of the American Academy of Political Science 610 (2007): 98–118. Fernández-Kelly, Patricia; Massey, Douglas S. (2016). "Borders for Whom? The Role of NAFTA in Mexico-U.S. Migration". The Annals of the American Academy of Political and Social Science. 610 (1): 98–118. doi:10.1177/0002716206297449. ISSN 0002-7162. Miller, Tom. On the Border: Portraits of America’s Southwestern Frontier, 1981. Thompson, Olivia N. (2009). "Binational Water Management: Perspectives of Local Texas Officials in the U.S.–Mexico Border Region". Applied Research Projects. Texas State University. Paper 313. Thompson, Olivia N. (2009). "Binational Water Management: Perspectives of Local Texas Officials in the U.S.–Mexico Border Region". Applied Research Projects. (Paper 313). hdl:10877/3758. Prampolini, Gaetano, and Annamaria Pinazzi (eds). "The Shade of the Saguaro/La sombra del saguaro" Part IV 'About the Border'. Firenze University Press http://www.fupress.com/ (2013): 461–517. Jeremy Slack, Daniel E. Martínez, Scott Whiteford, eds. The Shadow of the Wall: Violence and Migration on the U.S.-Mexico Border. University of Arizona Press, 2018. ISBN 978-0-8165-3559-0. 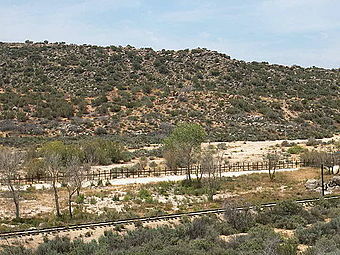 Wikimedia Commons has media related to Mexico–United States border. This page was last edited on 17 April 2019, at 04:02 (UTC).